UPDATE: I wrote about this letter six years ago when it was up for sale, but forgot (my post is here). At that time commenter Wolfgang, a German speaker, said that most translations of this letter, including this one are somewhat inaccurate, in particular that the phrase “childish superstition” is simply not in the letter, even in German. Wolfgang suspects this is a meme that has gotten perpetuated, probably because it appeals to some people’s preconceptions. (The gist of the letter besides that, however, seems pretty much the same.) Nevertheless, please see Wolfgang’s comment if you want his criticism of this and other translations. Why is everybody so concerned about whether Albert Einstein was religious or an atheist? I suspect that it’s because he’s regarded as The Smartest Man of Our Time, and so his opinion on any issue is taken as authoritative. And if Einstein was religious, well, then accommodationists can claim that science and religion are compatible. But there are two errors in that train of logic. Someone who’s a great scientist need not necessarily offer the most authoritative word on other topics. Further, just because a scientist might be religious does not—at least to me—show that science and religion are compatible. Readers should be familiar with my argument for incompatibility, so I won’t reprise it here. Nevertheless, the debate continues, although there’s ample evidence that Einstein was not a theist, but at best a species of pantheist who derived personal awe from the regularity of the laws of nature. He surely wasn’t religious in the sense that religious Americans are religious, as he abjured belief in a personal god, the Scriptures, and so on. The latest revival of the “Was Einstein religious?” issue is the reappearance of a letter that he wrote in 1954 in response to having read (at the instigation of a friend) a book promoting God and religion. Einstein’s letter was directed to the book’s author, Erik Gutkind (see below). The letter is up for auction again, and at a fancy price: it was bought in 2008 for $404,000 (Richard Dawkins was an unsuccessful bidder), appeared on eBay six years ago with an asking price of $3 million that wasn’t met, and is now up for auction by Christie’s, with an estimated selling price of between $1 million and $1.5 million. The high price is without doubt due to the letter’s content. You can see the reports at CNN, LiveScience, and the Washington Post. It turns out the letter is pretty damning about religion and God, explicitly rejecting both; the former is a “childish superstition” and God “nothing more than the expression and product of human weakness.” The Bible, too, is merely a “collection of primitive legends.” After reading the letter (see below), it would be hard to maintain that Einstein was religious in any sense! Still, without Brouwer’s suggestion I would never have gotten myself to engage intensively with your book because it is written in a language inaccessible to me. The word God is for me nothing more than the expression and product of human weakness, the Bible a collection of honorable, but still purely primitive, legends which are nevertheless pretty childish. No interpretation, no matter how subtle, can change this for me. For me the Jewish religion like all other religions is an incarnation of the most childish superstition. And the Jewish people to whom I gladly belong, and whose thinking I have a deep affinity for, have no different quality for me than all other people. As far as my experience goes, they are also no better than other human groups, although they are protected from the worst cancers by a lack of power. Otherwise I cannot see anything “chosen” about them. Now that I have quite openly stated our differences in intellectual convictions it is still clear to me that we are quite close to each other in essential things, i.e; in our evaluations of human behavior. What separates us are only intellectual “props” and “rationalization” in Freud’s language. Therefore I think that we would understand each other quite well if we talked about concrete things. Since this was written a year before Einstein’s death, I think it can stand as the culmination of his thinking, regardless of how deistic, theistic, or agnostic he was earlier. Einstein was certainly not mentally incapacitated or demented when he wrote this, and so those who say Einstein was religious will have to somehow rationalize the letter away. I look forward to the religion-osculators at Brainpickings and Krista Tippett’s unctuous show “On Being” coming to grips with Einstein’s words. Tippett, I suspect, would somehow try to claim that Einstein still had a quasi-religious faith. This entry was written by whyevolutionistrue and posted on October 5, 2018 at 11:15 am and filed under Accommodationism, atheism, Faith versus Fact, osculating the rump of faith, osculation of faith. Bookmark the permalink. Follow any comments here with the RSS feed for this post. Both comments and trackbacks are currently closed. Einstein published an essay in the New York Times called “Religion and Science” in which he distinguishes three senses of the word “religious” and states he is religious in only one of them. In that essay he disavows belief in a personal God saying that in the “struggle for the ethical good, teachers of religion must have the stature to give up the doctrine of a personal God”. The essay was castigated by various rabbis and prominent Catholics. Now, this sort of precision in defining your words is always pleasing to me. semi-demi-hemi-quasi-MoreOrLess-kinda-sorta-religious should, like Al himself, define exactly what they mean by the term. IMO, Einstein was religious in the same sense that Ralph Waldo Emerson, Henry David Thoreau, Walt Whitman, and John Muir were religious. Since Richard Dawkins at a talk I personally attended said he was not sure that Buddhism was really a religion in the “proper” sense, but more of a philosophy with an ecclesiastical structure built around it, Dawkins might not consider Emerson or Thoreau et al to be religious. Einstein’s brilliance as a scientist was nearly matched by his diplomacy. Apologists were quick to capitalize on his congenial statements during, and especially after his lifetime. Dawkins stated something along the lines that he was around 97% atheist,(coincidentally(?) close to genome overlap % with chimps) and allowed for a miniscule probability of theistic belief accuracy.John Muir was diplomatic from a different perspective considering his father’s influence. One of the reasons Einstein used conciliatory language about religion is that he had a much bigger concern than theism vs atheism, namely the threat to the Jewish people. America really was not ready to cope with the concept of atheism. link to cites for those quotes and more. Excellent link. Thanks. Going deeeep! John Muir’s father was a ferocious Scottish Calvinist, and from early on, Muir was in fierce rebellion against that form of piety. Muir found much more source of reverence in the forest than in any picture of a crucified Jesus. The about quote is attributed to Einstein. I may not have it exactly right. I would like to hear arguments as to why someone who made this statement would not be considered religious. Or why he would be religious. Einstein seems to be using “God” or “the Old One” as a metaphor for nature, not as a reference to a personal god. God (Altmann) does not play dice with the universe perhaps because he doesn’t exist in order to play anything with anything? What does that say about Einstein? Good answer. Maybe that was it! If someone hits their thumb with a hammer and starts blaspheming, does that mean they are religious? The English language cannot, outside of very specific situations, be read with the precision of a legal document. English is a flowery, poetic language, filled with metaphors. I have used two in that sentence–yet I doubt you would argue that I think English literature literally contain flowers, or that since there are spaces between metaphors it is not, in actuality, filled! Scientific literature attempts to avoid such language, but not always successfully, and it seems that the more prominent the scientist, the less rigorous they are–Gould’s essays (not his peer-reviewed papers) certainly used such conventions, for example. “God” is often used as a metaphor for unknown causes. It’s like saying “It’s lucky the lightning missed me!” Strictly speaking, it’s NOT luck; we could examine the physical forces involved and determine why the lightning behaved as it did. But it’s superfluous to do so. Similarly, when discussing cosmology and the grand questions of physics in a semi-formal or informal way, “God” is frequently used as a metaphor for those things which we know must exist, but which we haven’t found yet and often haven’t defined yet–the reason why, in a nutshell, the universe is what it is. This isn’t uncommon–Hawking did so, for example. I’m not saying that Einstein used the term in that way. I frankly don’t care; he was a genius in physics but I’ve never considered him an authority in culture, philosophy, religion, or other portions of the humanities. I’m merely presenting this as one possible explanation. Teachers of religion must have the stature to give up their doctrine of a personal God. The inference is that there would still be religion after the giving up of the doctrine of a personal God. I would kindly like to remind you of my post ( https://whyevolutionistrue.wordpress.com/2012/10/22/einsteins-anti-god-letter-goes-for-3-mil/#comment-310744 ) in 2012. TLDR: This translation of the letter is both extremely common online AND objectively incorrect. 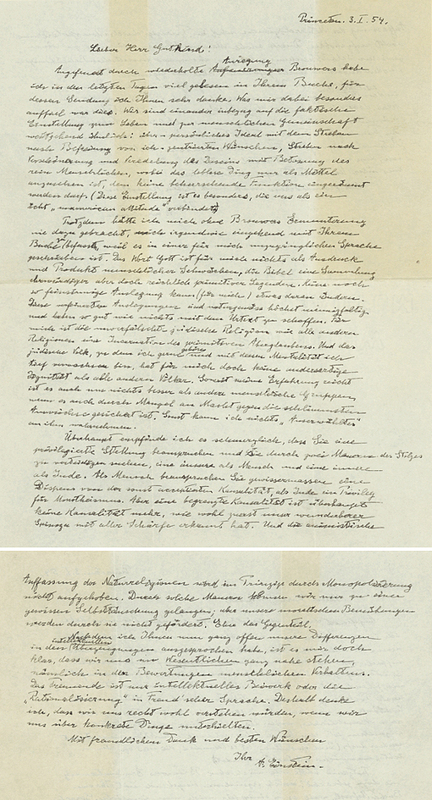 Some parts of the translation do not correspond with anything in Einstein’s original letter at all (e.g. : the “childish” part). I am probably fighting a battle I can’t win. But would you please update the post to make it correct? It’s not a battle; I had forgotten about that entirely and of course will link to your comment in the post above and say there seems to have been some mistranslation. Besides the “childish” bit, though, it seems that the tenor of the letter isn’t that different from the rest of the translation, no? It would be good if you could translate the letter in your own words. If you do, I’ll either add your whole translation to this post or put it in a new post. I do want to be accurate and apologize for forgetting your comment or even that I’d posted on this letter previously. Apologies: I didn’t mean to suggest that I am battling JAC or anyone else on WEIT. I merely wanted to express that it is difficult to scrub this particular mustache / translation from the internet. Thank you for asking, but I don’t think I am the best person to provide a more decent or more official translation. Iam traveling and I won’t have access to a computer anytime soon. Moreover, I am sure others are more qualified. Thank you for being so generous and quick to update the earlier post. You could send an email with a better translation to the site Letters of Note (page about the letter, with contact details), asking them to update it. Is there any evidence of a genetic basis for proclivity toward religion? I highly doubt it. As has been pointed out numerous times here, it seems to correlate mostly with where you were born, the general economic status of your country, and your parents’ beliefs. For the latter you might point to some as-yet unidentified “genes,” but this is probably easily disproved by looking at “mixed” marriages (one parent adopts the beliefs of the other) vs. the frequency of those beliefs being passed down to offspring. Without going to hunt sources up I’ve read, I will say that what I’ve read about this area of the brain makes it sound similar to the functions of the area of the brain that we are told deals with addiction in which the addictions can be to drugs, alcohol, tobacco, sugar, etc. A broad range of categories. Maybe, God(s) are addictions too. Yes, that’s my take too, although Einstein himself wasn’t comfortable calling himself a “pantheist” (see quote below). Re the letter, however, we need to put it in context. Einstein was replying to the author of a book that made outlandish claims about the Jewish religion, going so far as to say that Abraham freed himself and the Jews from “natural causation.” Einstein strongly and openly rejected this kind of religious nonsense throughout his life, so that he should reject it here is not anything new. Also, it’s important to note that Einstein rejects the word “God”: “The word God is for me nothing more than the expression and product of human weakness, the Bible a collection of honorable, but still purely primitive, legends which are nevertheless pretty childish.” I would agree wholeheartedly with Einstein’s take on “the word God” and on the Bible, but I remain a pantheist. Einstein claimed to be agnostic and said he was not an atheist. But the sentiments in that letter could have been written by Dawkins himself. Ol’ Alby demonstrates once again he wasn’t a bad prose stylist. Maybe so, but having translated German (specifically Rilke) I’m always hesitant to assume the translation accurately reflects the “prose style” of the original. Look at the flaws in translation of Biblical elements such as the virginity of Mary. I’m more familiar with translation issues in literary works of prose and poetry where it can make all the difference in the world. I will defer to you on this topic Herr Gary. I said “no”, but the teacher and the rest of the class said “yes”. I suspect that it’s because he’s regarded as The Smartest Man of Our Time, and so his opinion on any issue is taken as authoritative. Although his “c = constant ” and “E = mc^2” were completely amazing and an indication of a true genius, Einstein had some pretty dumb ideas about human nature, e.g. a world government. That “god doesn’t play dice” quote gets a lot more mileage than it deserves. I think the authority concepts of Christianity saturate their thinking about any number of things from how to define a word to how to think about famous people. Many thought Flew’s ‘conversion’ meant an automatic claim on the attention of atheists. I expect the efforts to twist Einstein into a positive Theist runs along those same lines. If we value his contribution to science, so the thinking goes, we must then accept his views on God. Add to that sloppy reading and opportunistic quote mining and you have the formula for many a shameless apologetics post.